The Russian Federal Space Agency (Roscosmos ) successfully launched the Progress M-28M cargo craft on Friday, July 3, with approximately 2.4 metric tons (5,290 pounds) of food, fuel, and supplies for the International Space Station (ISS ) crew. The spacecraft’s lift-off atop a Soyuz-U rocket took place at exactly 04:55:48 UTC (12:55:48 a.m. EDT), from Launch Site 1/5 at the Baikonur Cosmodrome in Kazakhstan. After the launch, the four side-mounted boosters of Soyuz-U burned for one minute and 58 seconds, each consuming nearly 40 metric tons of propellants. The boosters separated from the rocket, falling back to Earth for a crash landing 216 miles (348 km) from the launch pad. The rocket’s core shut down at T+4 minutes and 47 seconds with stage separation and the third stage ignition occurring at T+4 minutes and 57 seconds, as part of the hot-staging sequence used by the Soyuz. Eight minutes and 45 seconds after the lift-off, the spacecraft separated from the rocket; at eight minutes and 49 seconds, the spacecraft entered preliminary orbital insertion, and then it deployed its power-generating solar panel wings together with the KURS navigational antennas. Progress will dock to the Space Station’s Pirs docking compartment, after a two-day flight at approximately 3:13 a.m. EDT (19:13 GMT) on Sunday, July 5. The Automated Rendezvous will be initiated on Sunday at 00:51 a.m. EDT (04:51 a.m. GMT) as Progress will begin to use its KURS System to guide itself to the vicinity of ISS through a series of rendezvous burns. The two-day trip includes a set of two orbit-raising maneuvers to be performed by Progress on its third orbit around Earth. Today’s mission has gained more significance after two recent failures to resupply the ISS. On April 28, the Progress M-27M cargo craft was lost when the rocket’s upper stage malfunctioned toward the end of its burn before separation of the spacecraft, sending it spinning out of control. 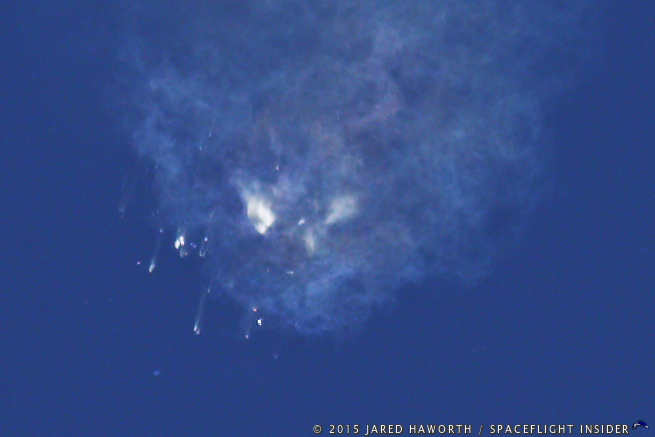 The spacecraft re-entered and disintegrated in the atmosphere on May 8. The next ISS resupply mission was lost on June 28. SpaceX’s Falcon 9 rocket broke apart nearly two-and-a-half minutes after it launched from Cape Canaveral with a Dragon spacecraft, destroying more than two tons of payload inside, including a new docking adapter for the Station. However, the Space Station’s managers insist that the Expedition 44 crew on board the orbital outpost have sufficient supplies until late October. Therefore, NASA has not ordered any additional cargo to be taken to the ISS following Sunday’s failure. Even in case of another Progress failure, a Japanese Kounotori HTV-5 cargo vessel is slated to be launched on Aug. 16. It will lift off from the Tanegashima Space Center in Japan for a four-day trip to the station where it will be grappled and berthed to the Earth-facing side of the Harmony node. On Monday, June 29, the orbital module of the Soyuz-U, containing Progress M-28M, was transported from the spacecraft processing facility for the general integration with the launch vehicle. The next day, the spacecraft was integrated with the rocket in the processing facility. A decision was also made to roll out the Soyuz-U with the Progress cargo craft to the launch pad. The rocket components arrived at Baikonur earlier in the year and went through acceptance testing. 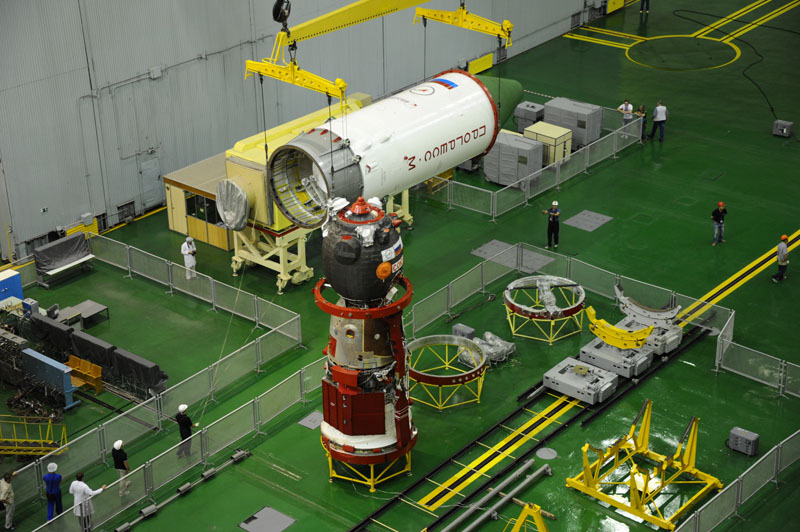 Soyuz-U was rolled out from the integration building to the launch pad on July 1. It was then installed on the launch pad. The rocket was hoisted to a vertical position by a hydraulic lift system, and then rotating platforms moved around the launcher to give workers access to the vehicle final flight preparations. Countdown initiation occurred eight hours ahead of the Friday’s launch time with the activation of the Soyuz launcher and Progress spacecraft for a last round of checkouts and reconfigurations. The Progress cargo module is similar in construction to the crewed Soyuz spacecraft’s orbital module. The spacecraft docks automatically to the space station and there is also a backup remote control docking system. Progress is composed of three components: the Cargo Module, Refueling Module, and Instrument-Service Module. The Cargo Module carries pressurized cargo which the crew transfers to the station through the docking hatch. 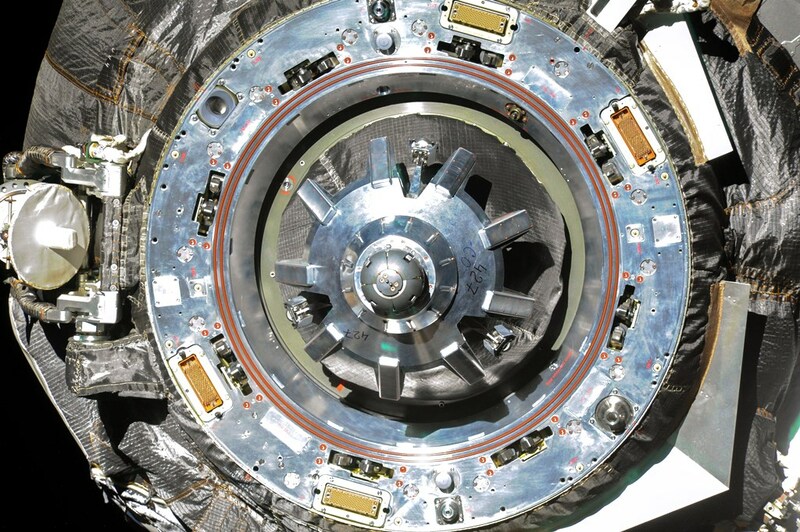 After the module is unloaded, trash, unwanted equipment, and wastewater can be loaded into the Progress for disposal when the spacecraft leaves the Station. The Progress M-28M spacecraft on its route to the ISS is loaded with 1,146 pounds (520 kilograms) of propellant to refuel the Station’s Zvezda service module, 105 pounds (48 kg) of oxygen, 926 pounds (420 kg) of water and 3,071 pounds (1,393 kg) of food, spare parts, logistical items, medical supplies, and experiment hardware – all totaling 5,249 pounds (2,381 kilograms). A successful arrival of the freighter will add about one month to the supply levels of vital logistics such as water and food. The vehicle will be greeted by Russian cosmonauts Gennady Padalka and Mikhail Kornienko and NASA astronaut Scott Kelly. The crew focused on science this week. Kelly worked on a variety of advanced microgravity science and on a botany research exploring how plants sense gravity and how roots grow in space. Meanwhile, the two cosmonauts were on the Russian side of the orbital lab conducting science and maintenance. The duo explored the dynamic forces the station experiences caused by mission events such as vehicle dockings and spacewalks including internal activities like physical exercise. While the Progress is docked to the Station, it uses its propellant and thrusters to perform Station re-boost maneuvers. Trash is loaded into the cargo module when the Progress has completed its mission and is ready to leave the Station. Progress vehicles normally remain at the Station for two to three months. The Soyuz-U is the most flown rocket in the historic Soyuz launcher family. The launch vehicle is currently used to transport Progress spacecraft to the ISS and occasionally to launch military reconnaissance payloads. The vehicle stands 167 ft. (51.1 m) tall with a main diameter of 9 ft. (2.95 m) and a maximum diameter of 33 ft. (10.3 m). Lift-off mass is about 313 tons. It is capable of delivering payloads of up to 6.9 tons to the low-Earth orbit (LEO). The next Progress spacecraft is currently scheduled for launch on Sept. 21, 2015. 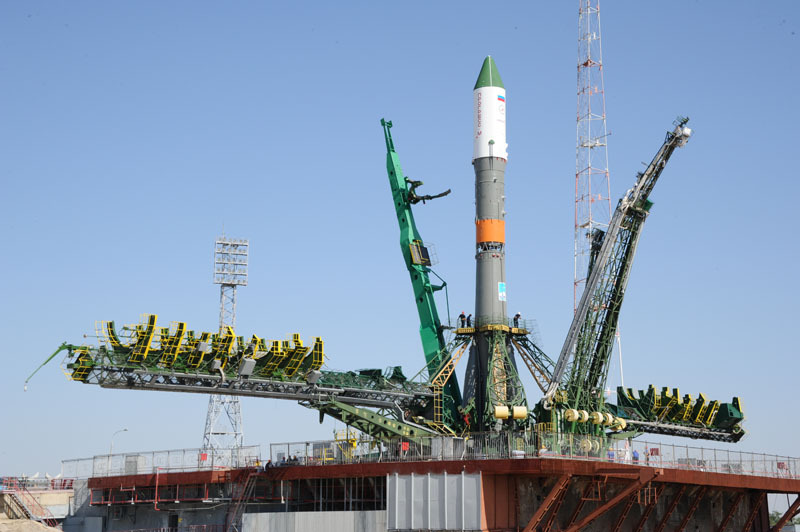 The Progress M-29M vehicle will also be launched by a Soyuz-U rocket from Baikonur. The upcoming mission will be followed by the first flight of the Progress MS spacecraft in late November for a total of five Progress launches this year. Moreover, a single Orbital’s Cygnus mission on Atlas V will further improve the Station’s cargo situation before regular Dragon and Cygnus missions resume in the first half of 2016. 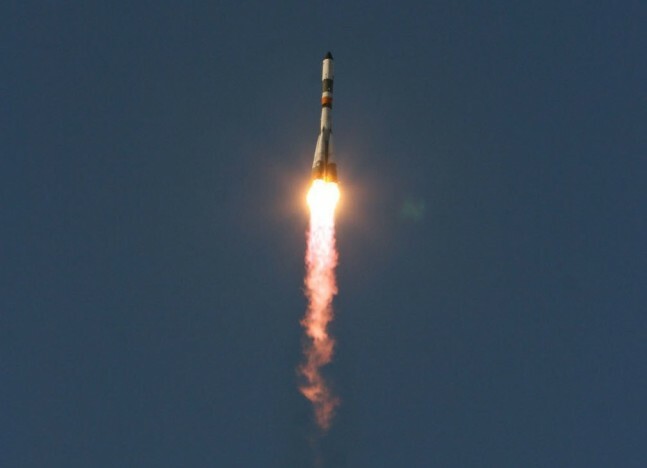 The Russian have suffered 2 Progress resupply launch failures in the past few years. They have proven that you don’t just give up. That makes it 4 resupply failures for the ISS program. But, who’s counting. I’m sure that the Progress liftoff & successful ride to orbit was cheered in all the ISS participating countries. I wonder if ISS would have been jeopardized if China had been invited as a partner? If the recent string of failures has proved one thing it is that the more available spacecraft for ISS ops the better. But geopolitics hampers our (humankind’s) outer space ambitions.